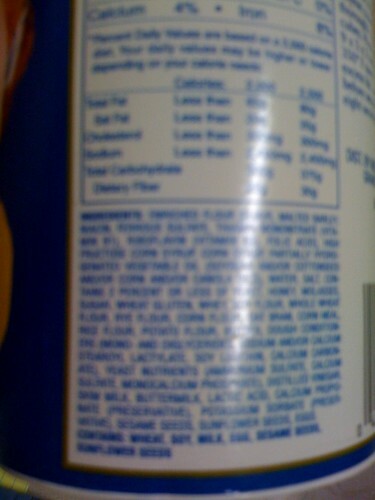 If you take a moment to look at the ingredient list, you’d discover that there’s a bit more than “breadcrumbs” in there. As it turns out, disgustingly, these bread crumbs contain a ridiculous number of ingredients, including high fructose corn syrup. What the hell is HFCS doing in there? Note: I apologize for the graininess of this image; it was taken with a mobile device. It’s probably better that you can’t really read the ingredients in that blurred image. There are way too many. I’d feel much more comfortable if it just said, “Ingredients: Bread”. Sometimes it’s surprising what lengths industrial food processing will go to save a cent or two.